Ever since I decided to take a stand in favor of culture and proper gameplay by bumping miners, I have received my share of hatemail. But EVEmail can also be an instrument of good. As word spreads about what I have done, sometimes people whom I've never seen before will send me mail regarding the services I provide. 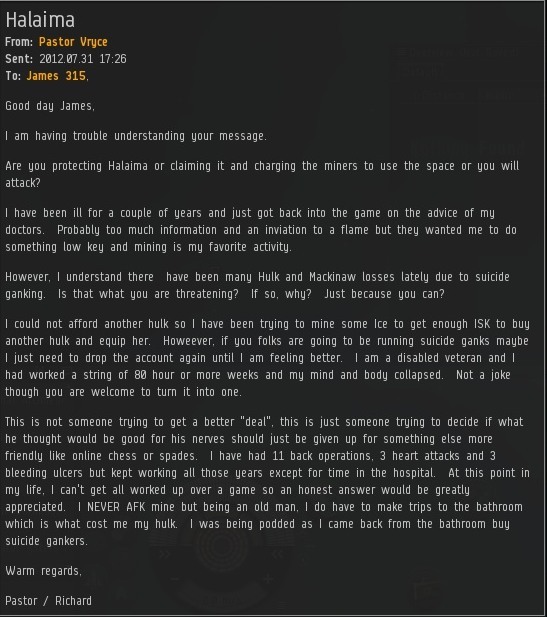 Today I received a lovely EVEmail from a gentleman miner who heard about the New Order and wanted to join. Enclosed was a link to a contract for two miner permits, and a torpedo. I don't know why some people prefer to send money via contracts, but they do. Usually this results in me reading and re-reading the terms of the contract over and over until I'm satisfied that it is not, in fact, a contract scam. 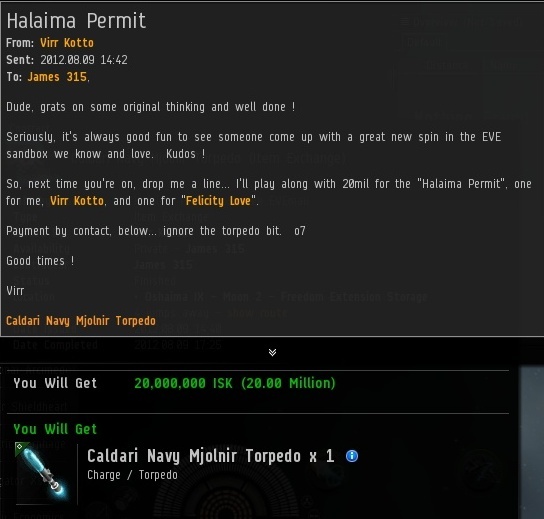 Can you say "giev torpedo or bump"? That's not the first time I've received payments with my mail. Before the latest gank nerf, there was a lot of confusion being spread around about my services. That's the definition of a true friend, one who tells you to send me isk before you've ever been bumped. Hopefully this becomes a trend. Finally, I'd like to share this epic EVEmail from someone I hadn't contacted, but maybe who thought I had? Or maybe the suicide ganker referred him to me? By now we should all know from my previous post that going to the bathroom while mining does constitute AFK mining under the Code. I am absolutely sympathetic to health issues, but allowing exceptions would be an invitation to abuse. Luckily, this EVEmail has a happy ending, as the miner in question was able to negotiate the purchase of a mining permit for full price. VCBee 206 > why dont you just pay and we let you go free?